[A]: Mutton (goat meat) rezala at Sabir’s in Kolkata was something to look forward to if you visited that part of the city. The chief attraction of eating out was to taste something different from home cooked food and being able to buy the same at amazingly low prices. Sabir was successful in bringing this Muslim stew dish to the forefront and catch the imagination of the people of Kolkata. The dish is rather easy to cook and can be a real money maker in the restaurant business as it uses some very basic ingredients and cheap cut meat that has a generous portion of animal fat. The dish’s appeal is from the long slow cooking over a charcoal flame that helps to soften the meat and blend the fat with the light yoghurt sauce to produce a delicate, flavoursome stew where spices are minimum and subtle. A drop of rose or Kewra water at the end gives the stew the emanation of restaurant quality food. Since it is so easy to cook, I have tried cooking this dish many times at home. I have cooked it with various cuts of meat – cheap stewing meat from the lamb’s leg or shoulder – but I have realised that it tastes much better if the meat is on the bones rather than boneless. So I have now narrowed down on cutlets from a rack of lamb for my rezala. This is definitely a deviation from tradition as the fat on the rack of lamb is substantially less than what you would get in a traditional stewing meat. I feel that the bit of fat on the cutlets is sufficient to enhance the flavour of spices in the stew and yet light enough to be eaten more frequently. I love the taste of the chunky meat on the bone that becomes succulent with the slow cooking in the oven. In an Indian restaurant menu of over-spiced dishes, the rezala stands out as a very mild sour stew with subtle spice flavouring. The sour taste usually comes from alu bukhara – a sour cherry widely available in Bangladesh and West Bengal. I have used juice from fresh lime instead which makes it a bit different in taste but gives the desired sourness. I would strongly recommend using alu bukhara, if you can get hold of some. The finesse of spice comes from the tempering with whole spices. Tempering of spices is a traditional method to extract the full flavour from spices and is also known as tadka. Essentially this is when whole spices are heated in hot oil and then added to a dish. The hot oil or ghee makes the spices more fragrant and flavoursome, brings the essence of the spices to the fore and maintains this essence when it is added to a dish. The stew looks quite dull in comparison to other curry dishes from India. It does not have the usual spices like turmeric, coriander, cumin or red chilli powder – which provide the colour to a curry dish. So sometimes I add a bit of turmeric powder in the spice mix just to make the dish a bit more lively. However, this is definitely non-conventional as Rezala is a Muslim dish and the concept of coating meat and fish with turmeric is strictly a Hindu tradition. Marination – In a food processor blend the onion, ginger and garlic along with a splash of water to a fine wet paste. Mix this paste with the yoghurt, mustard oil and lime juice. Spread the mixture evenly on the lamb cutlets and let it marinate at room temperature for 4 hours. If you prefer to marinate longer, leave it in the fridge for at most 12 hours. Fresh Garam Masala – Garam masala is the term used to describe the dry spice mix. Every dish has a unique combination of spices and hence the generic garam masala mix available in shops is rather misleading. The unique spice in the rezala is mace (javitri). 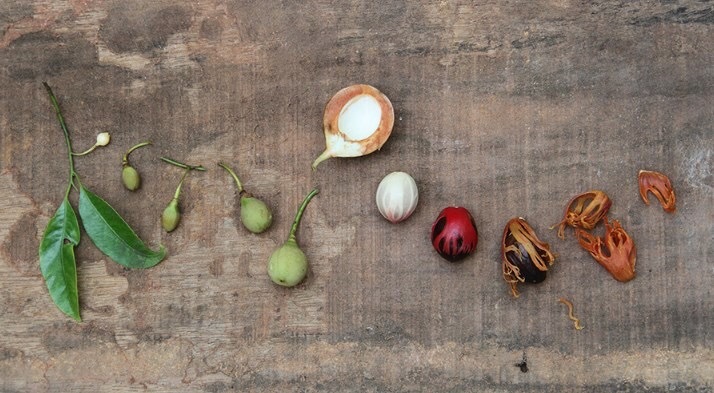 Mace is the inner skin of the nutmeg fruit which is separated and dried. This is a highly cherished spice and is sparingly used, mostly in festive cooking. Heat a dry skillet and toss the whole spices mentioned earlier till they start to release their aroma. This is usually in seconds, so be careful not to burn the spices. When still warm, transfer the spices into a spice grinder and crush to a fine powder. Cooking – Pre-heat the oven to 160°C. In a sufficiently large oven-proof, burner proof casserole or sauce pan with a tight lid, heat the ghee in low heat till the ghee melts. Meanwhile blend the poppy seeds, cashew nuts and green chillies with a splash of water to a fine paste. The secret of any good stew is not to cook at high temperature. So it is important to keep the heat low throughout the cooking of the rezala. It is also not customary to brown the meat. But I prefer to brown the meat not just to give it a nice colour but also to hold the meat together. So I pick up the meat pieces from the marinade and lightly brown them on the melted ghee on both sides at low heat (about 5 minutes on each side). Then add the rest of the marinade to the meat along with the saffron milk, water, dry spice mix, salt, sugar and the wet gravy mix. Make sure all the meat pieces are covered and the mixture is sufficiently runny. Use more water or milk if necessary. Bring the mixture to boil on the casserole without the lid on and let it simmer for about 10 minutes before putting the lid on and transferring it to the pre-heated oven. Cook for 45 minutes in the oven with the lid on followed by another 15 minutes with the lid off. These final 15 minutes will help to reduce the runny gravy and give it the desired consistency. Let the meat rest in the casserole for 15-20 minutes before serving. Tempering – This is the only step where you need high heat. Make sure to use ghee or some animal fat for tempering as white oil burns on high heat and becomes unusable. When the ghee is sufficiently hot, release the whole spices. The spices will start to release their fragrance almost immediately if the ghee is sufficiently hot. As soon as this happens, switch off the heat. Spread the warm aromatic whole spices along with the rose water on the rested meat in the casserole. The rezala is now ready to be served. Accompaniment – Rezala is served best with rumali roti, naan bread, kulcha paratha or plain basmati rice.